An exceptional experience awaits in Namibia. This is a land of vast and spectacular landscapes, of giant dunes, mountains, savannah, and possibly the oldest desert on earth. 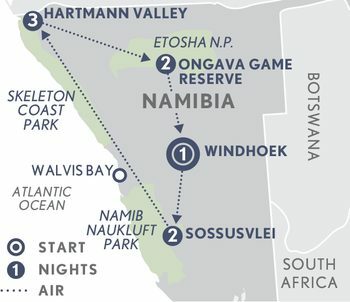 An exceptional experience awaits in Namibia. This is a land of vast and spectacular landscapes, of giant dunes, mountains, savannah, and possibly the oldest desert on earth. It’s a destination that will enthral the return safari enthusiast with its fantastic and unique wildlife experiences, and exceptional photographic opportunities. An excellent range of luxury accommodation options, from boutique hotels to unique tented camps and remote lodges, is sure to impress the discerning traveller. Low Season: From $13,805 per person twin share. High Season: From $18,400 per person twin share. Arrive into the Namibian capital where you are met and transferred to your elegant and stylish boutique hotel. Day 2: Windhoek – Sossusvlei. Board a light aircraft flight for the journey south into the private 37,000 hectare Kulala Wilderness Reserve — the gateway to Namibia’s Sand Sea with its towering dunes. See desert-adapted wildlife such as ostrich, springbok and gemsbok. Smaller creatures such as bat-eared fox and aardwolf can be seen at night. Your base is Little Kulala Camp, a luxurious desert retreat whose thatched ‘kulalas’ merge seamlessly into the landscape and offer a private plunge pool, rooftop ‘star bed’ and luxury fittings including indoor and outdoor showers. Activities at Little Kulala include morning guided drives to the spectacular dunes of Sossusvlei, among the highest in the world, walks as well as game drives in this pristine private wilderness reserve with incredible views, desert-adapted wildlife and plants. Day 4: Sossusvlei – Hartmann Valley. This morning, fly from Sossusvlei to Serra Cafema Camp (arriving late in the afternoon), in the extreme northwest of Namibia, set amongst shady trees on the banks of the Kunene River in the Hartmann Valley. The Kunene River is the only permanent source of water in this region and creates a lush oasis along its banks. Two full days to explore. Activities revolve around the surrounding Namib Desert sands and the lush oases along the river, including informative nature drives and guided quad bike excursions through the dunes. Day 7: Hartmann Valley – Ongava Game Reserve. Fly east to the Ongava Game Reserve which borders Etosha National Park to the south. Etosha National Park is Namibia’s premier wildlife destination and one of Africa’s largest game reserves. In the dry season, large herds of wildlife congregate around the waterholes and the endless plains offer breathtaking vistas. Perched on a rocky outcrop overlooking a waterhole, Little Ongava is known for its panoramic vistas of the surrounding savannah, and for its exclusivity. This afternoon, enjoy a game drive with the possibility of night viewing. Day 8: Ongava Game Reserve. Activities at Little Ongava revolve around day and night drives, visiting hides and walks with experienced guides. Game drives and daytrips into the easily accessible Okaukuejo area of Etosha National Park are rewarding with sightings of lion, elephant, gemsbok, springbok, red hartebeest and white and black rhino. For those who enjoy close wildlife encounters, tracking white rhino on foot is an exhilarating adventure. Day 9: Ongava Game Reserve – Depart Windhoek. This morning, return by air to Windhoek airport where your adventure ends.